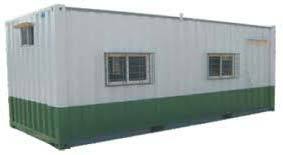 We have placed ourselves among the leading manufacturer and supplier of Portable Metal Cabin based in Karnataka, India. We have a well-developed manufacturing unit with advanced machinery that helps us in producing the best quality Portable Metal Cabin with excellent designs and dimensions. We customize our products according to the requirement of our customers. Our customers have been appreciative for the quality we deliver and promptness with which we process small as well as bulk orders of Portable Metal Cabin.